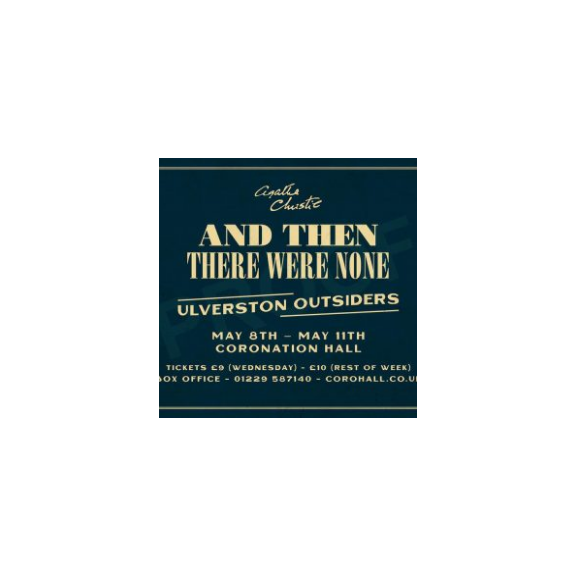 Ulverston Outsiders Present: And Then There Were None. Join the Ulverston Outsiders for their production of Agatha Christie’s ‘And Then There Were None’. Eight strangers are invited to Soldier Island by the elusive Mr. and Mrs. U. N. Owen. Upon arrival, the guests are met by the housekeepers, with assurances that the hosts will be arriving the next day. That evening, a seemingly disembodied voice accuses each of the ten strangers of a specific murder. Shortly afterwards, one guest chokes to death in front of everyone. Was it an accident? Or something more sinister? As the hours tick by with no help from the mainland and the death toll quickly rising, it becomes clear to the survivors that there is a murderer among them. One bent on enacting their own form of justice for the skeletons in the strangers’ closets. The events take a sickening turn when the survivors realise that each death is being orchestrated to match a mysterious rhyme that is framed above the mantelpiece.